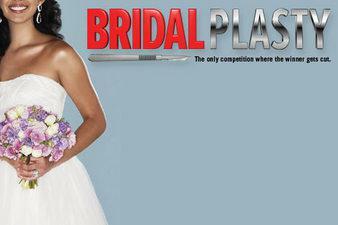 So, there’s this new horribly delicious “reality” show on Sunday nights called Bridalplasty. One can’t have high expectations when it comes to watching reality television but you can certainly prepared to be shocked, horrified, and highly entertained. This show is plastic surgery meets Bridezilla and is hosted by Shannah Moakler. So, the show’s premise is twelve nearly-perfect brides move into a mansion and compete against one another in wedding or surgery related competitions for the grand prize. Hold onto your socks because the grand prize isn’t a all expenses paid wedding, or honeymoon in Vegas– The grand prize is all the free plastic surgery a girl could want. They may have natural diamond rocks on their ring finger, but one is going to be completely man made pretty soon. The highlight of the first episode was totally the injection party! Yes! A real, live, injection party! The challenge was for each women to complete a puzzle of what could be, their future self. Then, each girl bounced down the mansion stairs for a quick Botox reward, and finally a face mask. Yes, it was just as weird to watch. Still, oddly entertaining. I think we are oddly disgusted with ourselves to find out what next week’s episode will entail!!! In the end, as always, one lady was sent home without any plastic surgery. The rest of the ladies were pumped with $600 worth of filler. Killer prize? Mmmm, they must have been pleased. Another contestant gave an interesting opinion about why she wanted the surgeries. She explains, “Having these 15 surgeries, or more, it’s a lot. But to have complete confidence, that’s probably the best gift you could give a girl.” Sounds completely deranged to me. Will you tune in next week to see what kind of challenges these ladies have to face? Can you even turn away?!?! Will you watch until the end to see who wins? Or better yet, do you want to see the final results?